These recordings are dramatic, word-for-word narrations from either the KJV or NIV (you choose the version you want). 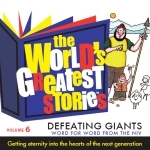 George Sarris uses the art of storytelling and incorporates carefully chosen music and sound effects into these exciting recordings straight from the Bible. They are so well done that you and your children will find yourselves listening to them again and again.